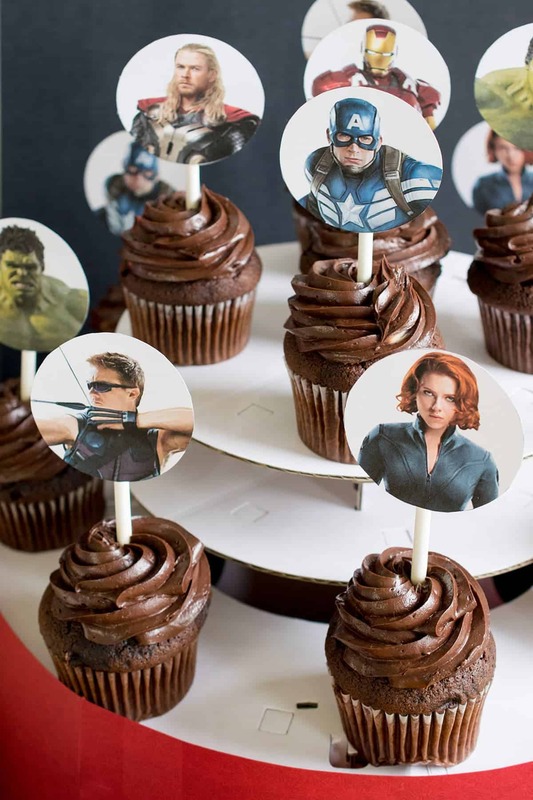 Looking for some Avengers Party ideas? This movie marathon is sure to entertain with everything from amazing party snacks, games, and favors to bring out the superhero in you. My son’s birthday was last month and I couldn’t get it together to host the party that I wanted to give him. I made it up to him, though. 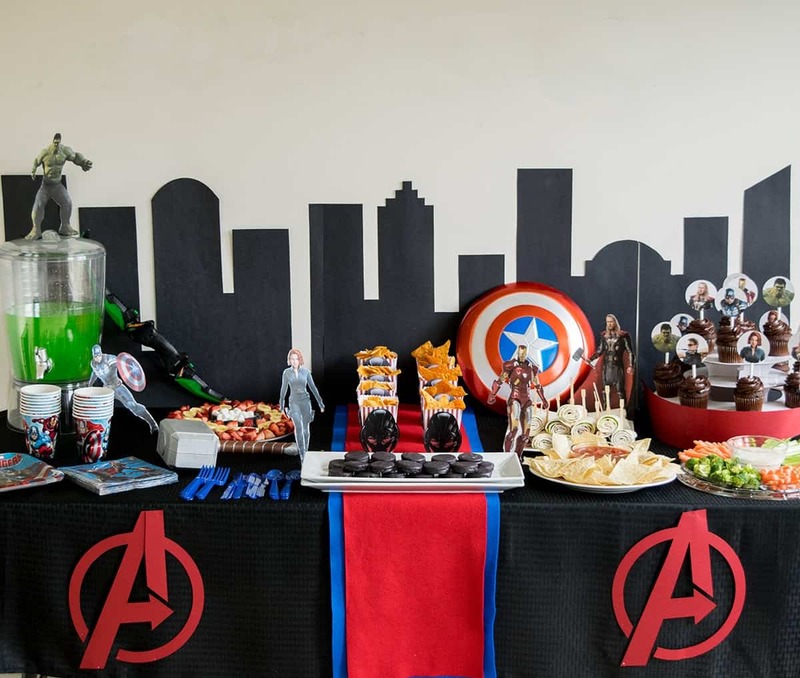 We are all Marvel fans around here and with the release of MARVEL’S The Avengers: Age of Ultron, a movie marathon party was perfect. I really got into planning this party. I included food that I thought was appropriate for each character. The whole gang made it too! Iron Man, Thor, Hawkeye, Natasha Romanoff, The Hulk, and my personal favorite, Captain America! The cupcake toppers and the stand-up superheroes are just pictures I printed directly from the internet and cut out. I printed the superheroes at 8×10 on white cardstock. They have popsicle sticks cracked in half and glued to the legs in order to stand up. Since this particular party was from Avengers: Ultron, the big bad made an appearance. But I kept him in line. That disapproving momma stare is like its own superpower. 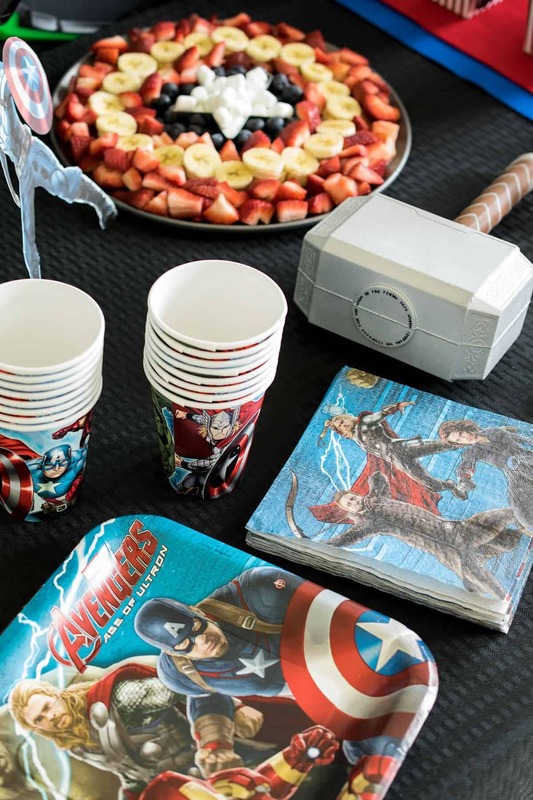 Everyone got their very own movie snack box with Avengers-themed goodies. Looking for More Party Ideas? Look no further, we have lots! 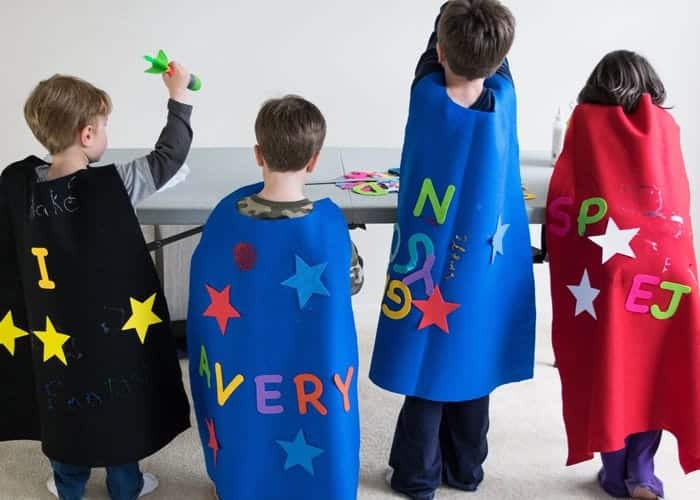 As a party favor, the kids got to make their very own superhero capes! I cut the capes out of felt and attached Velcro to the collar area. I bought foam shapes and letters, glitter glue, and markers. I then told the kids that they are being picked to be the next avenger but they need a costume. The kids had a blast with this project! Stars were quite popular as you can tell! Although we did take this picture, the glitter glue takes a few hours to dry (more for globby areas). Everyone got into the spirit with some of the fun toys like Thor’s Hammer and Captain America’s Shield. I love that it’s such an easy party to do! Yes, I made it. It’s just regular ol’ black poster board. I used a straight edge to draw an outline then just cut it with scissors. I stuck the sheets to the wall with double sided tape. Good luck with your sons’s birthday! what an awesome party! I love all the details, especially the capes. Thanks for sharing at Motivational Monday! LOVE the city building silhouette! What a clever idea! I bet all the kids loved making capes. What a fun party Rachel! The cape making was mayhem and I loved it! lol. They were so proud of their creations (even the upside down name). My son has been wearing his in the yard anytime the wind is blowing. It’s so cute! What a fun party for your kids, my children would be so jealous!!! So cute! I needed this in December. 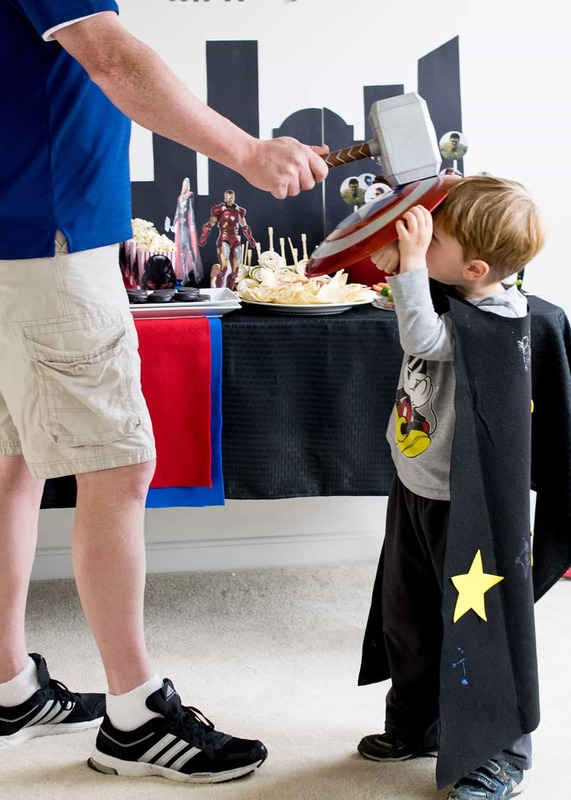 Well, I will definitely be putting some of these ideas to use later on because it seems my little boy has not outgrown the Avengers yet, and Lord willing we will be doing another Avenger themed party again this year. At least you will get to reuse some of those decorations. That is kind of nice. I just tossed our Toy Story decorations from a birthday party 5 years ago, and they never were reused. Little boys change their minds so quickly! Lol. To be honest, I really thought I was a Bat sorta girl. All we had growing up were the Batman and Superman franchises. And the X-men cartoons. My husband is really up on each of the characters and he says that until recently the characters in either DC or Marvel were completely separate. You could see crossover characters but Marvel characters only played with Marvel characters, etc. Probably more than you wanted to know but I was curious so I asked! My husband will be out of town this weekend but maybe we can do a weeknight movie next week! I love your party table. The backdrop is awesome! I love your backdrop and the cupcake toppers are TOO cute! 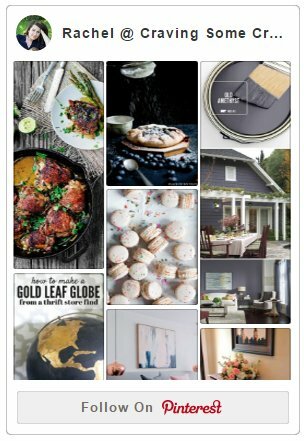 Pinning to my party board! Thanks, Ashley! My son loves the cutouts – he set them up all around his art table and he shows off his drawings to them, haha!